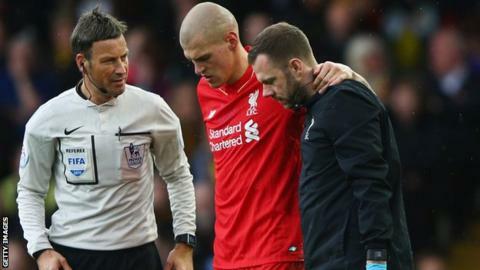 Liverpool defender Martin Skrtel has confirmed he will be sidelined for six weeks through injury. The 31-year-old Slovakia international limped off in the 41st minute of the Reds' 3-0 defeat by Watford on Sunday. In a post on his Instagram account, Skrtel said he had suffered a tear in his hamstring and tendon. He wrote: "I will work hard on my recovery and will do everything to come back as soon as possible and even stronger than before." Skrtel has been ever-present for Liverpool this season, making 26 appearances in all competitions.